Category Archives: NES – VS. Super Mario Bros. 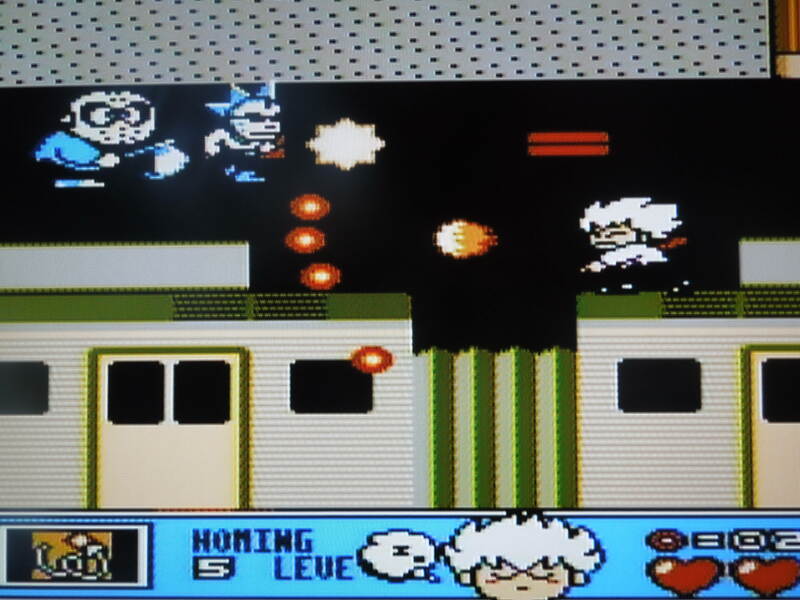 Note 1: This game was played on an NES 101 model (toploader) that was modified to output in AV composite (red, yellow, white) just like the original NES. It was connected to a 32-inch HD tv. Note 2: Like VS. NES games? Check out my review of VS. Excitebike. Like NES games in general? Check out my reviews of Little League Baseball, Doki Doki Panic, I’m Kid Dracula, Mighty Final Fight, Nekketsu Ice Hockey, Nekketsu Riki Kunio, Nekketsu Soccer League, Nekketsu Street Basket, SEC Tecmo Bowl, Tecmo Bowl Japan, Splatterhouse, and TMNT Tournament Fighters! VS. Super Mario Bros. was originally an arcade game. 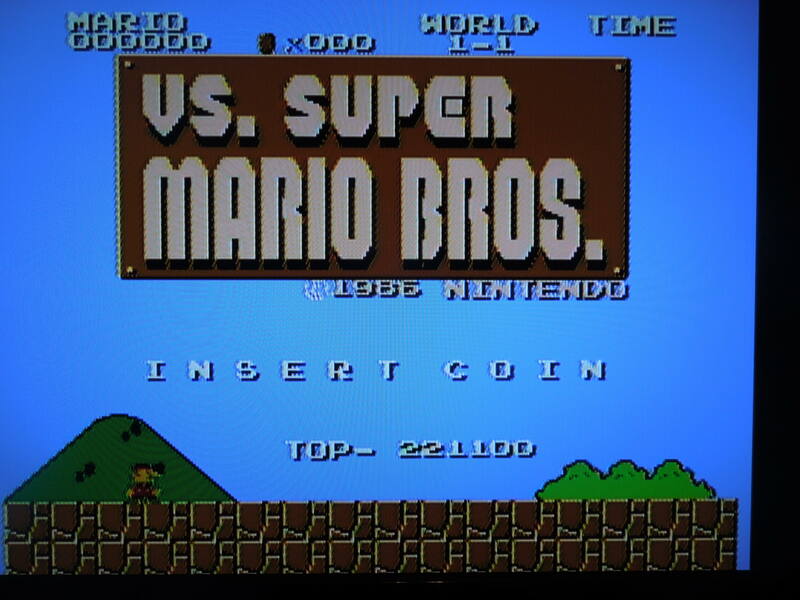 Quick History: Vs. Super Mario Bros. was released in arcades in 1986 – specifically the VS. UniSystem arcade cabinet. The VS. UniSystem played arcade boards that were versions of NES games, although most of the games were different from their NES counterparts. Somehow, NES reproduction makers have been able to put some of these old VS. arcade games onto NES cartridges for play on original Nintendos, and that is the case with VS. Super Mario Bros. VS. Super Mario Bros. and the well-known Super Mario Bros. are not exactly the same, and this review will address some of the differences. DIP switches: Because VS. Super Mario Bros. is an arcade game, the cartridge was created with DIP switches on the front. DIP switches are small white buttons that can be ‘set’ to certain positions to control things like the number of lives a player would receive for each ‘coin’ they inserted, how fast the stage timer would run in the game, how many coins the player had to collect to gain an extra life, etc. There is also a switch to set the game to ‘Free Play,’ meaning you don’t have to ‘insert’ a coin in order to play. In arcades, the owner was thus able to set his or her machines’ DIP switches to his or her own liking, and essentially ‘control’ how much money a machine would make. 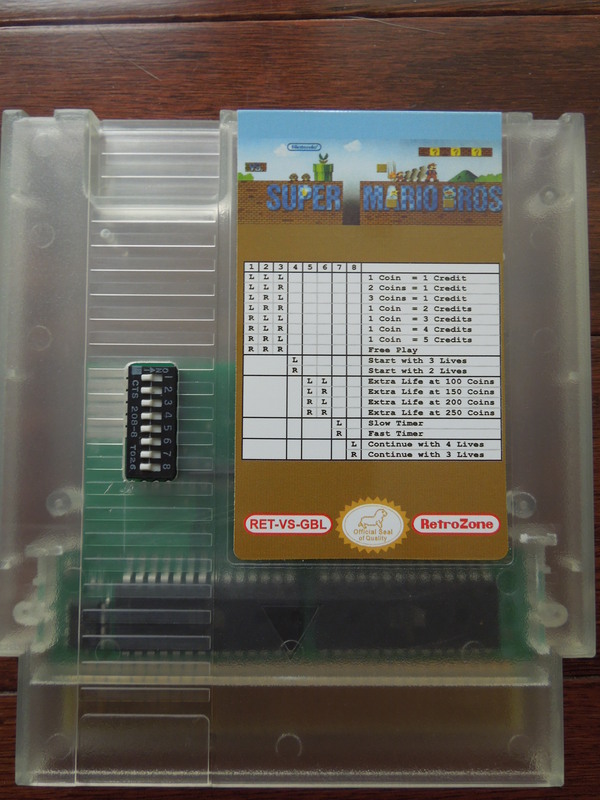 It’s nice to see the DIP switches on this cartridge of VS. Super Mario Bros., as you can ‘control’ the settings yourself, and essentially give yourself the best chance to beat the game by setting the switches in your favor. Add Credits by pressing Select & Start. Control: Unless the game is set to Free Play, pressing Select & Start together ‘inserts’ a coin. You can insert as many coins as you want and build up your Credits. 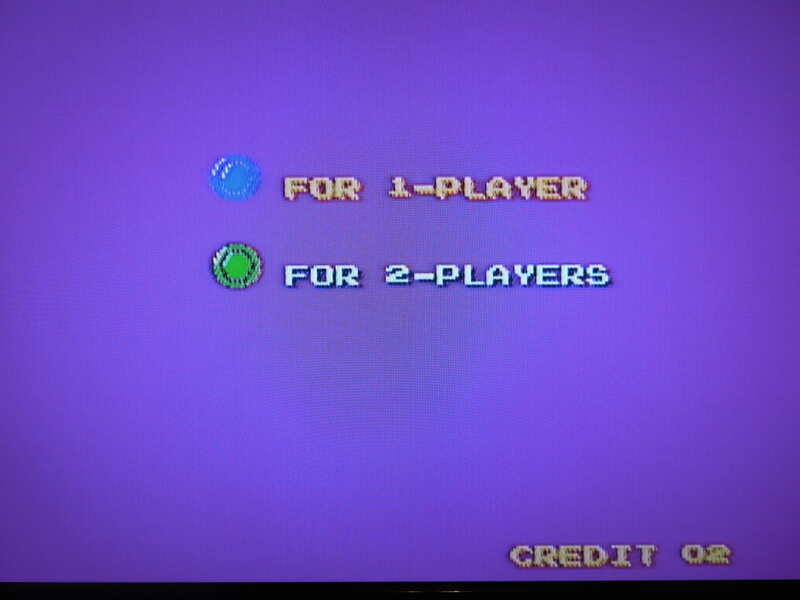 You have to enter at least 2 coins to enable the alternating 2 player option. During gameplay, holding B makes Mario or Luigi run fast, and pressing B when Mario has collected a Fire Flower causes him to throw a fireball. Button A causes Mario or Luigi to jump. You cannot pause this game. 1. Less 1-Up mushrooms in VS.
2. Less power up mushrooms and Fire Flowers (or they’re found in more difficult to reach locations) in VS.
3. You cannot warp to World 8 in VS. – the furthest you can warp is World 6. 4. Many of the levels are the essentially the same in VS. as they are in the regular NES version, except that they have been made more difficult with smaller platforms to jump on or more holes to fall into. 5. Many of the later levels in the VS. actually come from the Japanese version of Super Mario Bros. 2. 6. In VS., there is a high score screen where you can enter your initials if you get a high enough score (sadly, the cartridge won’t save your score). 7. The timer in each level runs quite fast, even if you have the DIP switch set to ‘slow’. You can’t warp any further than World 6 in this version. 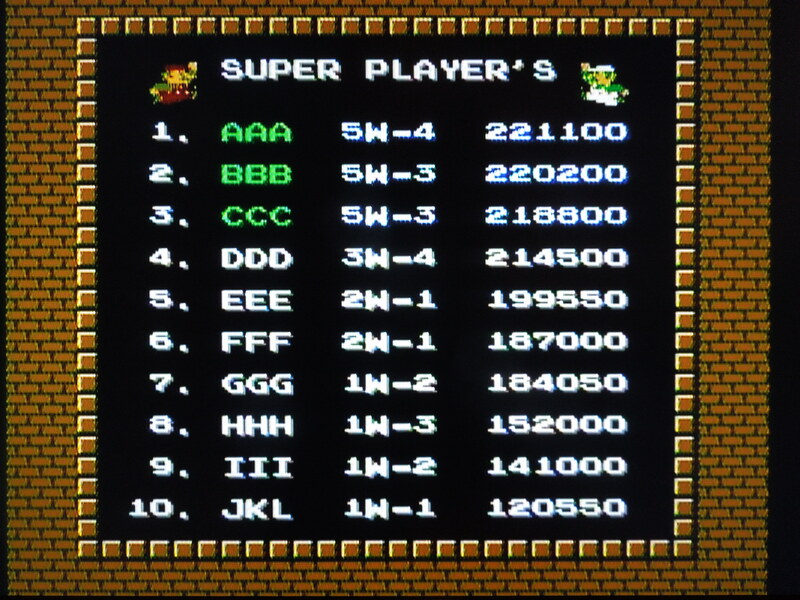 Difficulty: VS. Super Mario Bros. is quite difficult, as you can see from the list of differences. The game, like the original, has 8 Worlds, each split into 4 sections. (World 1-1, 1-2, 1-3, 1-4, and so on). Although you can enter as many Credits as you want, or set the game to Free Play, you still have to practice if you want to beat the game. The reason for this is, if you lose all of your lives (you can set the game to give you up to 4 lives per Credit) and elect to continue, you’ll start back at the beginning of the World you’re on. So, for example, if you lose all of your lives on level 8-4, you’ll go all the way back to level 8-1 when you continue. Trying to achieve a high score gives this game excellent replay value. So, where can I find this game? I got a copy from Retrozone some time ago. I’m not sure if it’s still available there, however. I believe it is a more difficult game for NES reproduction makers to create because of the arcade nature of the game, but you can always email NES reproduction websites and ask if they are able to make it. You can also play the game on a computer emulator. Conclusion: Vs. Super Mario Bros. is different enough from the original to warrant a playthrough – but beware, it is TOUGH (for me, at least). I found it more difficult than the Japanese only Super Mario Bros. 2, which is also a difficult game. 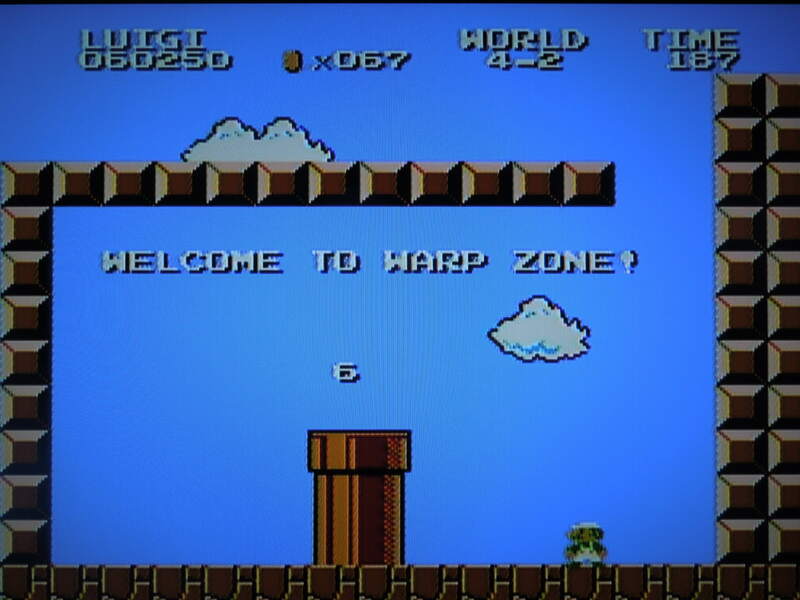 Not being able to warp to World 8 means you’ll have to master all of the levels in Worlds 6 and 7, some of which are incredibly difficult due to long jumps, numerous obstacles, and that quickly moving timer. I really, really like the addition of the High Score screen. Unfortunately, you cannot save your score, however – if the game had a battery for the purpose of saving your socre, it would be perfect.